Looking for Junk Pickup in San Ramon or in the Bay Area? Schedule Now For a Free No Obligation Estimate. Bye Junk is standing by to be your clean-up specialist. We offer fast, affordable and environmental-friendly junk removal in San Ramon so you don’t have to stress. From your household junk, furniture removal, green waste, or construction debris we are open to any challenge. Get a free, no-obligation estimate and pick up can be scheduled the same day. Call (925) 263-9001 to speak to one of our friendly customer service representatives or easily book online. Junk is our business but helping the environment is our passion. Part of our San Ramon junk removal service is to take the extra steps to keep junk out of landfills that competitors skip. If we find something that can be reused we make sure it is diverted away from the dumps. Each truckload that is composed of a mixture of metal, wood, yard waste, paper, plastic or cardboard is brought to separate facilities for recycling. At Bye Junk customer satisfaction is our focus and number one concern. When stressed about getting rid of personal items that are no longer needed, the last thing you need is to feel haggled and pressured by an unknown hauling service. We make sure to work within your busy schedule and do not conceal extra fees to trick you into paying more than what is fair. All pricing is determined before any work starts. Also, we handle all items with care and respect since not all items being removed are garbage. Bye Junk is on a mission to keep junk out of landfills. Any items we remove that are in reusable condition will be diverted from the dump. All metal, wood, yard waste, paper, and cardboard items (just to name a few) are recycled instead of junked. We can even recycle items such as appliances and old box springs! With junk removal in San Ramon, we don’t just pick up your items and go straight to the landfill. It is amazing what some companies take to the dumps. Also, we do not just throw and break items into our trucks. 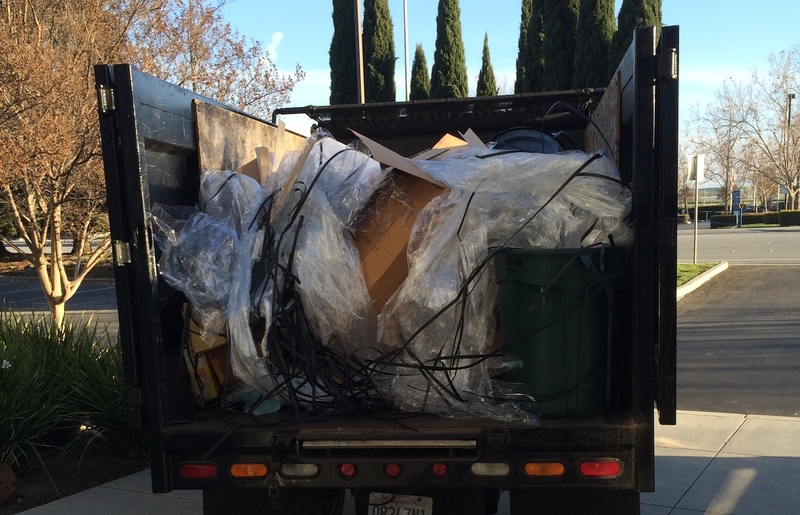 Your job does not end when we leave, that is just the first half of the Bye Junk San Ramon junk removal process. Bye Junk makes the junk removal process quick, easy, and affordable. We offer full service for every customer and through our extensive sorting process, we are able to donate or recycle a significant portion from all our loads. Call us at (925) 263-9001 for a free estimate today! Our company is clear without any tricks. No hidden fees, no surprise surcharges or fees, and no headaches. Our base cost is always $60 and $30 per cubic yard. We will come into your house, upstairs, downstairs, basement or backyard to pick-up and remove your junk. We can take almost anything! Call Us at Bye Junk for a Free No-Obligation on-site Estimate! We work every day to make sure you get service the day you want! We arrive at your location both commercial or residential with a branded large dump truck. Hello Bye Junk! They take a look at your junk that needs to disappear and begin to measure out all the junk to give you an accurate all-inclusive volume estimate. You will get an upfront estimate which will never change unless new items are added afterward. The pricing just varies depending on how much you fill up our truck and how long it takes us to load. If the price is agreed upon we will begin loading the truck in a fast but efficient manner stacking the items in the truck bed like Tetris pros. Most jobs take us an average of 30 minutes or less. After we finish loading and making sure to sweep and clean up any mess, we accept payment via cash, check or credit and say our goodbyes. Bye Junk! Just Say GOODBYE To Junk! We Always Donate & Recycle Before Discarding to the Landfill.